This is a how-to guide for harvesting honey using an extractor. Tools needed: extractor, uncapping tool, food grade bucket with spout, double sieve, jars/lids. Tips before you start: we strongly advise only harvesting honey on an easily cleaned surface. Otherwise, we recommend covering the floor with plastic. Also, never harvest honey outside, or you will be covered in bees in no time. Lastly, remember that 75-80% (depending who you ask) of the honey on the frames that you harvest, MUST be capped with wax. Otherwise, it’s not ready to be extracted. 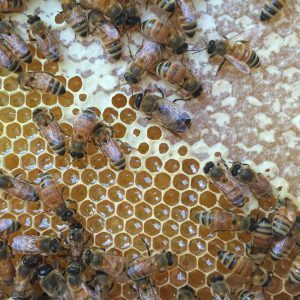 The bees cap honey with wax once they have reduced the water content enough to make it an unfavorable environment for bacterial growth, so if you harvest too much unfinished honey, you will increase the chance of your honey going bad. If harvested properly, honey should never go bad! 1. Remove the wax cappings from both sides of each frame of honey using an upcapping tool. There are a few different options available for uncapping tools. There are uncapping scratchers (pictured here), uncapping knives, and even heated knives that cut through the wax easier. We generally use both scratchers and knives, but we don’t use the heated knife, because we don’t want to expose our honey to heat. 2. Once uncapped, put each frame into the extractor until the extractor is full of frames. If you don’t have enough frames to fill the extractor, you should try to balance what you have. For example, this extractor holds 6 frames. If you didn’t have 6 frames, but you had 3, you would want to place the 3 frames evenly around the extractor, so that it’s balanced while spinning. 3. Hand crank (or turn on, if electric) the extractor for several minutes in either direction, until all of the honey has left the comb, and is dripping down the inside walls of the extractor. 4. Place a food grade 5-gallon bucket with a double sieve on top of it, under the spout of the extractor, and open the spout. The sieve removes bee body parts and pieces of beeswax that are in the honey, allowing only the honey to go into the 5-gallon bucket. 5. Open the spout of the 5-gallon bucket to fill each jar with honey. 6. Put the lid on the jar (and the label on the lid, if you wish). Now enjoy some honey for yourself, give some to your neighbors, and sell a few jars for extra cash! Last tip: children under the age of one year are NOT supposed to eat honey, due to the risk for botulism. We recommend informing anyone you give/sell jars to of this, just to be safe. First, we make sure the frames are loaded with honey to get them through the winter. If there are empty frames, we replace them with full ones. Then, we put “bee candy” on top of the frames (the white clumps in this first photo). This is a homemade fondant that we made, and that we hope the bees will not need. It’s an emergency source of food, in case the winter is longer than expected and the bees run out of honey stores to eat. On top of the metal grate, we put a medium hive box, and line it with a thin tea towel. On top of the tea towel, we fill the box with pine shavings. This is called a “quilt box.” The purpose of a quilt box, is to absorb condensation, so that it doesn’t drip on the bees, potentially killing them. Next, we put cardboard shims in between the quilt box and the inner cover, to vent the hive. Then we put the outer cover (not pictured here) on the very top and put heavy bricks on top of it, to help weigh down the hive, protecting it from winds. The last photo here, is of the “entrance reducer.” It helps keep cold air out of the hive, by reducing the size of the entrance. It also reduces the amount of space that any invaders would have to access the hive. Notice that the reduced entrance is about a half inch off the floor of the hive. This is intentional. In the winter, many bees will die and fall to the floor of the hive. Having the entrance/exit raised off the floor, keeps it from being blocked off by dead bees. Some beekeepers will also wrap their hive with some form of insulation. We have been considering doing this at Mayetta Farms as well, but so far we have found condensation to be a worse problem for us than the cold. The only other tips I would add, is that Thanksgiving is a good rule of thumb date, by which you should have your hive winterized. Also, if you have a problem with mice, consider buying a mouse guard for your hive, because mice will get inside and chew up your frames, if you let them. Welcome to Mayetta Farms, located in urban New England, but named after a tiny town in Kansas with a population of just over 300 people. My grandfather used to be one of those people, and he was a farmer. When I was younger, he was responsible for watching my brother and I, while my parents worked, so I spent many a days and nights on his farm, caring for cattle and playing in the creek and hayfields with my brother. Fast forward to my late twenties. My wife and I moved to New England and bought a house, and for the first time ever, we owned land. Not much. Okay, so it’s just a backyard, but it’s ours. Nostalgic for the years in Mayetta, I decided I wanted to plant a garden, but I didn’t retain much farming know-how from my younger years, so I just planted a few things and started reading books and watching videos. We started falling in love with it. Each year became a mission to grow bigger, better, and more efficient, within the confines of our yard. Over the course of a few years, I built four large raised beds and purchased several planters. I built a compost bin and started composting all of our food scraps. We started collecting rain water. We bought a colony of bees…and then another. We bought 64 shiitake mushroom logs and learned how to care for them. We bought an incubator and a hutch, and learned how to hatch and care for quail. The list goes on, and this is only the beginning. Mayetta Farms is a work in progress, with ultimate goal being a larger scale farm on a bigger piece of land. Until then, we are working with what we have, to learn what we can about farming. In urban farming, we have come to understand that there is plenty to learn, even in a small space like ours. On a micro-farm, there is no choice – the farmer must learn to be efficient and creative with their space and resources, because both are limited. We believe that learning to be good efficient micro-farmers, will help us to be successful on a larger scale when that time comes. So, here we are. We have a page. We thought a website would be a good idea for a few reasons. First, we get asked a lot of questions, and end up answering many of the same ones repeatedly. If we had these answers written down on a blog post, we could simply send people the link, saving ourselves a lot of time. Second, this seems a good way of documenting our journey, so that we can look back later and reminisce. The third (and least selfish) reason for starting this page, is to teach others (and for them to teach us, in the feedback we receive). Perhaps you only have a small space and are looking to for inspiration on how to make the most of it. Or, maybe you just like to read about neat little things, like how to harvest and purify beeswax. Whatever brings you here, thanks for reading, and stay tuned. We have more to talk about in these coming years, than you can imagine! Get some 2×4 studs and cut 4 pieces to 3 feet long. These are your corner posts. Get some cedar boards from Home Depot/Lowe’s. Get 8 boards that are 8 feet long and cut all of them in half to make 16 boards that are each 4 feet long. These are your sides. Connect your 4 studs by screwing in cedar boards around the bottom of them. So you’ll have 4 studs running vertically as corner posts and 4 cedar boards forming a square around the bottom of the corner posts. Do the same thing around the top of the studs – 4 cedar boards forming a square around the top. Notice in the photo that there are gaps between the side boards. This is for ventilation. So, attach your remaining side boards spaced out, leaving gaps. There is no need to be precise with the spacing (just eyeball it), but if you line the boards up with each other as you go, you can make sure your squares are straight. Once all of your side boards are on, simply staple some chicken wire around the inside of the walls. This keeps the compost in, but allows air to circulate. Now it’s ready! You can either buy some more boards to make a lid, like I did, or just throw a tarp over it! I find 3 feet to be a good height for removing finished compost, but some folks like to make one side a bit lower for better accessibility. It’s up to you, but hopefully this gives you some guidance. One last tip — if you prefer something a bit smaller, consider getting 6 foot cedar boards instead of 8 foot. Cut them in half, and this will make your compost bin 3×3 feet, instead of 4×4 feet.